Apologies. Truly. That wasn’t very nice of me. But I am a dietitian and I have to at least lead people to believe I eat something other than Strawberry Nutella Muffins and baked doughnuts for breakfast (I do…promise). For the record, I had oats TWICE this week for breakfast. But in all truthfulness, I try to post a balance of the sweet, the savory, the very, very healthy, and even some of the “watch the portion!” foods. At least that’s what I aim to do. With healthy twists, ideally. Like in this recipe, I subbed in whole wheat pastry flour for most of the flour. I’ve said it many times before, but you really ought to get your hands on some whole wheat pastry flour or white whole wheat flour. The stuff works miracles in baked goods. 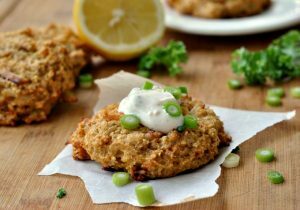 I also opted for low-fat buttermilk, and had the recipe called for vegetable oil…I would also sub in canola oil for the heart-healthy mono and polyunsaturated fatty acids. Preheat oven to 350 degrees. Line a muffin tin with paper liners or grease well. Set aside. In a medium bowl, whisk together the flour, salt, baking powder, and sugar. In a separate bowl, whisk together canola oil, egg, buttermilk, and vanilla. Mix the wet ingredients into flour mixture. Add slowly and gently stir, you don’t want to over mix. The batter will be very thick; fold in the strawberries. Fill each muffin cup half way with batter. Next, add a small spoonful of Nutella to each muffin cup. Cover the Nutella filling with the remaining batter. Sprinkle each muffin with turbinado sugar. Bake muffins for 22-26 minutes, or until muffins are golden brown and a toothpick comes out clean. Remove the muffins from the pan and let cool on a cooling rack. Yield: 10 muffins. Result: So sinful and fresh! 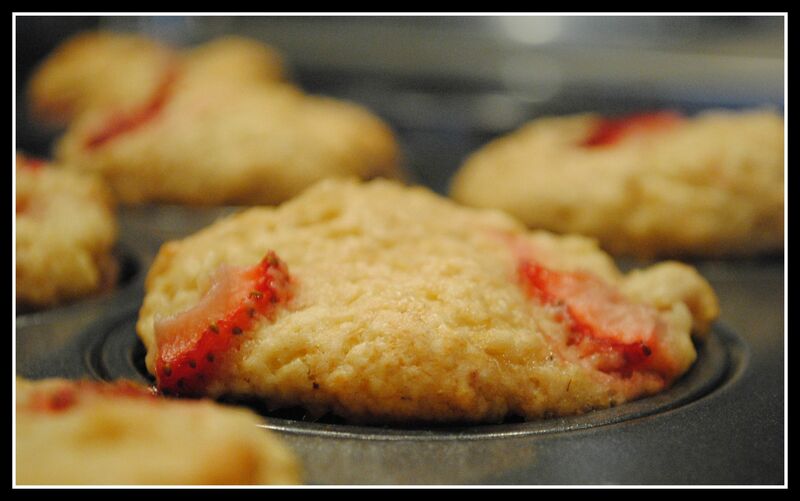 The strawberries add a lot to the muffins and despite the very thick muffin mix, the muffins are fluffy and light! I am also pleasantly surprised with the nutrition stats aren’t too shabby at all! This week is draggging…anyone else? Question: How do you eat Nutella? That’s one thing I always struggle with when writing on the blog. I swear I eat balanced… it just seems I get more excited to talk about the more decadent things on the blog (no one ever sees the oatmeal or salad I eat on a practically daily basis!). These look delicious! Strawberries and Nutella work so well together! YUM!! This is one of those recipes that I wish I could make at work, because I know they would be a huge hit. We serve Nutella at work with our Magic Pops (the very large rice cakes). I prefer peanut butter though, personally, but in muffins?? Nutella sounds wonderful! BTW, I love your “print this” function on your blog. I’m going to have to find out how you do that. I used it last night to print your PB Thai burger recipe, and it was pretty awesome. I’m glad you like it! I don’t know how to add that — Julie from Savvy Eats who designed my blog put that in. You know I’m technologically challenged 🙂 Getting verrry excited for next Wednesday!!! Thurman’s, here we come! How I eat (my homemade) nutella: grab spoon – scoop into jar – mouth. Heh. Maybe when my life slows down a little bit?? I am planning on it, have the post all written up in my head, just need to get it on the computer! I love using whole wheat pastry flour in my baked goods. And to answer your question, YES this week is totally dragging for me! Wednesday felt like Friday! ME TOO. The whole week just feels like a bad joke…it’s going that slow. Anything with Nutella has to be good! Finally–thank you! I’ve been drooling since it was mentioned on facebook. Nutella is one of life’s perfect foods. I’ve been eating it since I was itty bitty in Germany and have been obsessed ever since. 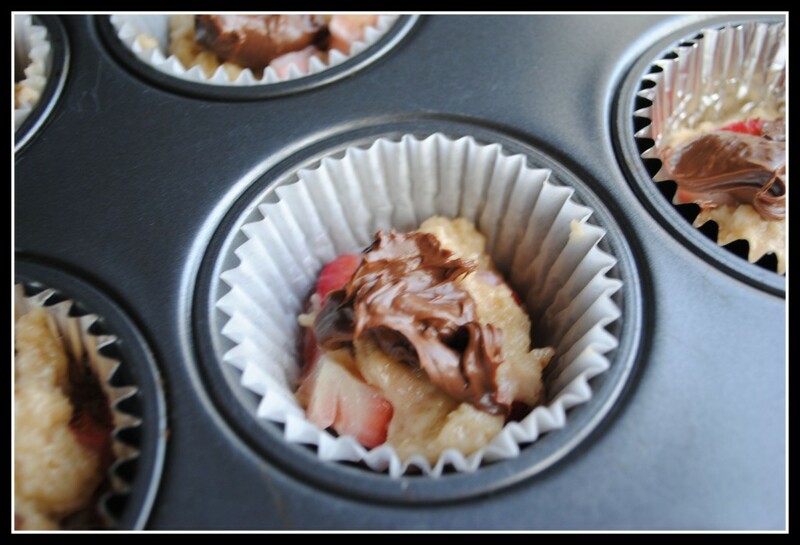 I love the spoon method, toast method, baking method, brownies, strawberries…if it has nutella, I will LOVE it! 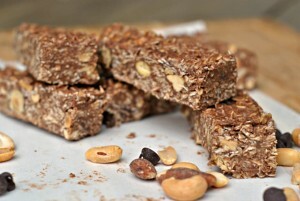 Now, when will you post the oats you mentione a few days ago that sounded amazing?? Yum! Seriously, you had me at the word Nutella. I eat it straight out of the jar with a spoon. It’s dangerous in my house! these look amazing nicole! i do not eat nutella but i think i would like it! You had me at nutella! haha. These look amazing. 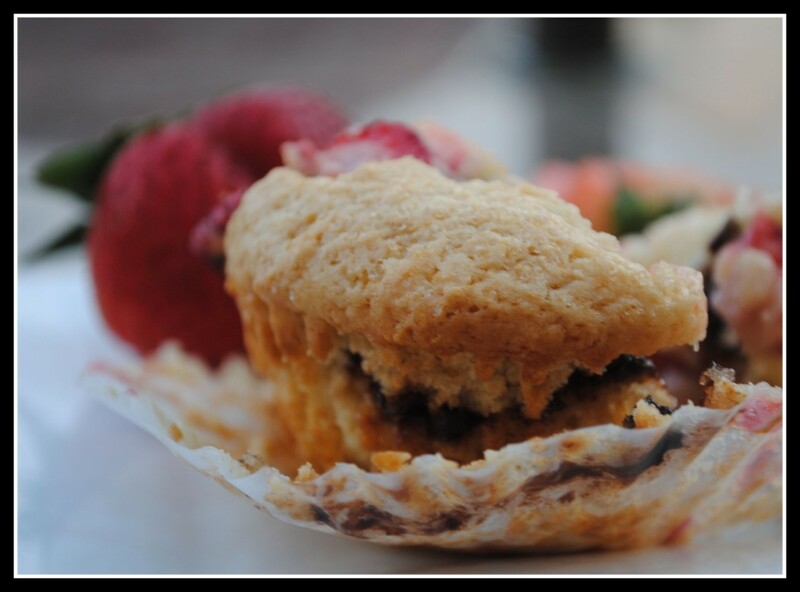 I love chocolate dipped strawberries so I’m thinking I would love the combo in a muffin. These look delicious! Its unfortunate that I can’t have nutella in the house — I would eat it all in an instant! These look SO good. I want! Well, this sure didn’t help with my Nutella cravings. I think I have to cave and buy some. Oh my goodness what a winning combo! I don’t usually eat Nutella-it’s one of those trigger foods that makes me want more! For a minute, I thought there was a new strawberry-flavored Nutella. But my favorite way would be in crepes, though these muffins sound awesome, too…and not too guilt-inducing! Ok, I confess…my favorite way to eat Nutella is by the spoon too! (Lol, I blame Mike…he’s the one who brings the jar and 2 spoons! 🙂 ) I’d love them in these muffins too though…they sure are pretty!